Ten years ago, Los Angeles was craft beer’s biggest sleeping giant. Nowadays, consider it woken way the hell up; we've gone from having only a handful of breweries and brewpubs in LA county to nearly 100, with a scene built on the backs of trailblazing beer bars, where local drinkers first got to taste top brews from California and beyond. 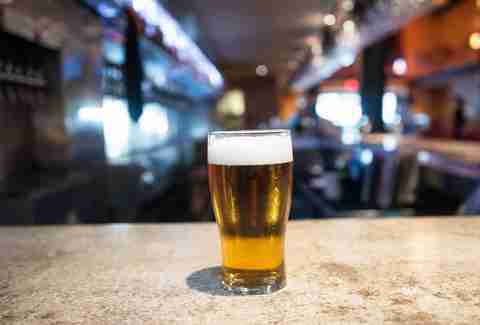 Some of these stalwart beer bars are still intact, while newcomers have bolstered their ranks with the holy trifecta: rotating taps, a range of styles, and enough patience to explain it all to you. 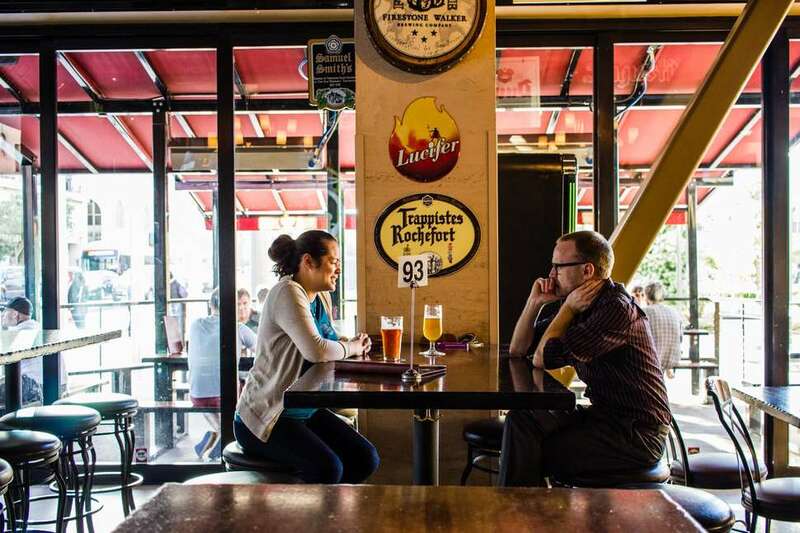 Craft beer might be as ubiquitous as Budweiser now, but some bars still know it’s all about pairing the right taplist and the right environment, quietly spreading the gospel that not all beers are fizzy yellow lagers. Those are the bars you should be seeking out -- and consequently, those are the bars we've outlined for you here. This little chalet has been serving craft beer since before most craft beer fans were born. In the ‘80s, then-owner Lou Moench pulled Budweiser from his menu and started selling Sierra Nevada and Anchor instead (to much confusion from his customers). Today, Father’s Office is owned by chef Sang Yoon, who previously ran the kitchen at fine dining restaurant Michael’s and now owns Lukshon. Yoon kept the innovative 36-deep taplist, added a full food menu (including the infamous no-substitutions-allowed dry-aged beef burger), and is expanding the brand with a much larger second location near Culver City and a third under development in downtown. Part of the Ramirez Liquor empire of eastern Los Angeles, The Cellar in Uptown Whittier is the family-owned chain’s only bottle shop and taproom. Floor-to-ceiling beer and wine bottles -- from twist-off to cork-and-cage -- line one wall, and brightly lit fridges wrap around the other, leading you toward shelves of glassware for sale and a dimly lit bar in back. Grab something from the shop and pay a small corkage fee to drink it on site, or try something from the 24 rotating taps that lean heavily into the underappreciated San Gabriel Valley and 562 breweries. The Danish gypsy-brewing empire of Mikkel Borg Bjergsø finally landed in Los Angeles, bringing with it a cosmopolitan tap list of sometimes-freaky beers poured in a downtown warehouse decked out all minimalist chic. This isn't the kind of place to get a pitcher of IPA and watch the game. As a brewery (now with a home in San Diego), Mikkeller’s specialty is in experimental beers that push the boundaries of flavor and style; his international chain of beer bars supports the same, meaning that small pours and high prices come with the territory. Savor (and budget) accordingly. A bar that’s attached to a popular music venue on the Hollywood Walk of Fame doesn’t have to try very hard for business, and yet Blue Palms Brewhouse has become a genre-defining brewpub, with a fine dining approach to bar food and one of the best rotating beer selections in the region. In the early days, owner Brian Lenzo would have to personally drive to breweries in San Diego and Northern California in order to bring back specialty kegs from Russian River, Alpine and more. Nowadays the beers get delivered to him, including one-offs and special releases only available at Blue Palms. The brick corner door known as Glendale Tap has held down a lonely stretch of San Fernando Road (barely in its namesake city) for only five years, but it feels like it’s been lived in for a lifetime. Peanut shells line the floors, vintage tin beer signs count as decor, and the soap in the bathroom is the old pink powder kind that you have to rub between your hands with some water to activate. Fifty-two taps rotate between the hyperlocal (Eagle Rock Brewery is down the street) and the far-off (Founder’s Kentucky Breakfast Stout). Bring quarters for the pool table. No, it’s not a church and they don’t host AA meetings -- but yes, it is a Catholic church-themed beer bar. 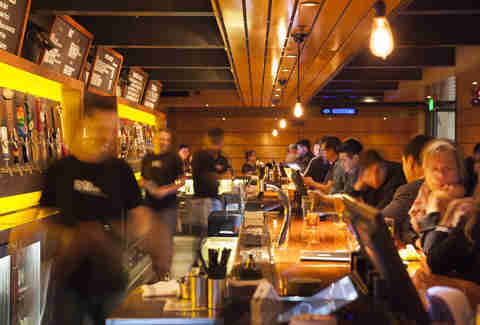 The first Congregation Ale House chapter opened in downtown Long Beach in 2010 with a flushed out theme that extended to the daily pint specials (“The Chosen One”), the generous happy hour (“Mass”) and the international bottle list (that included all six Trappist beers available in California). 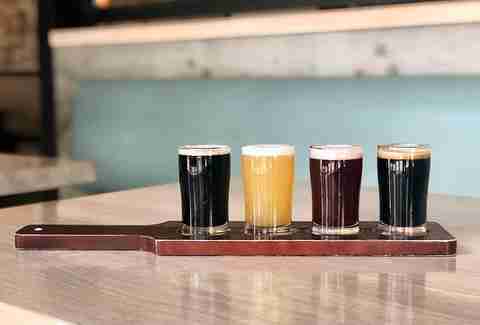 All four locations (one’s in OC) keep tap lists peppered with local, regional and even house-made beer, brewed at the Azusa brewpub chapter under the name Congregation Ales. A bottle shop with an attached taproom was an unhear-of concept when Sunset Beer first opened its doors. Eventually, though, the whole city saw the benefits in having a corner store stocked with obsessively sorted bottled and canned craft beers paired, with an adjoining bar of leather couches and board games where you could pop one open and enjoy it. A small and efficient tap list features kegs of new local releases, and the patio gives you a rare opportunity to smoke and sip at the same time. 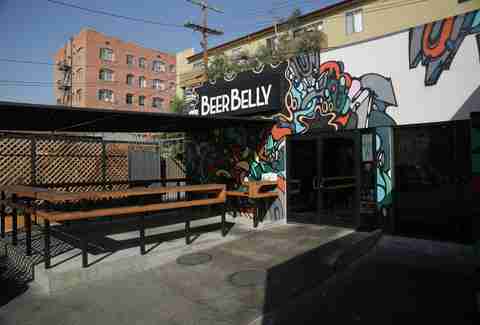 When the original Beer Belly opened in Koreatown nearly eight years ago, owner Jimmy Han wasn’t even sure if he could fill 12 taps with craft beer made in greater LA. But even as the scene exploded around his pint-sized fshop (two patios have since expanded its footprint), Han kept his small tap list mighty, rotating through special releases and hosting a monthly event called One Night Stand:a tap takeover featuring different local independent breweries. This tradition continues in Long Beach, where a second Beer Belly recently opened with 32 taps, a full liquor license, and a Tiki-themed speakeasy. The Redondo Beach pier is a relic of times past. Its most notable features include a mid-century ode to mai tais called Old Tony’s, and an International Boardwalk of concrete and seafood aromas where you can play vintage arcade games, order whole steamed dungeness crab (when in season), and drink from one of the 100-plus taps at Naja’s Place, a harbor-view working class dive and one of the first craft beer bars in LA. Rumor has it that the real Naja tends bar out in Barstow somewhere, but she left her mark here: a place where drinkers of macro and microbrews alike mingle on the daily, and an annual IPA fest draws thousands down the boardwalk in search of hops. “All California all the time” is the theme of Mohawk Bend, a cavernous beer bar and restaurant built into a former single-room movie theater on Sunset Boulevard in Echo Park. The wood-fired pizza, creative salads, and vegan nibbles draw in the non-beer drinkers, while a 72-deep taplist of exclusively Golden State beers (so long that it needs to be printed on a tri-fold menu) draws in the curious beer fans. Mohawk Bend is the brainchild of Golden Road Brewing founder Tony Yanow, who over the last decade opened a slate of neighborhood bars (see also: Tony’s Darts Away in Burbank) and recently took money he made from Golden Road’s sale to Budweiser to invest in a series of small brewpubs across LA (beers from which make it on tap at his bars). When an old Polish deli with a Budweiser tap in the suburban sprawl of LA gets inherited by third-generation owners who have a nasty craft beer obsession, you get Uncle Henry’s Deli: a fully functioning sandwich shop with over 100 taps built wherever they would fit into the back wall. Every square inch of space in this late-night storefront taken up with beer these days -- from the bookshelves of wax-dipped, annual-release bottles you can take home, to the mind-boggling array of tap handles, their contents displayed on flat screen TVs. Overwhelmed yet? Don’t worry, the owners and their friends are always around to answer questions and help you find the perfect pour. 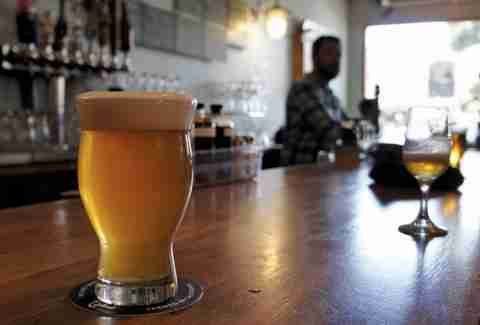 You know Beachwood for its award-winning house beers, but the original location in Seal Beach got its start as one of the best craft beer bars in the country. Owner Gabe Gordon is a fine dining chef and self-proclaimed beer nerd who selfishly wanted to open a bar that served his own favorite beers, from Russian River’s Pliny the Elder to Cantillon’s famous gueuze. 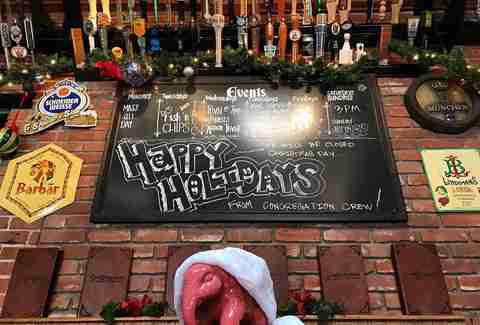 The concept expanded into Long Beach brewpub territory in 2012 and even though the list of Beachwood Brewing beers has grown crowded, the guest taps (and downtown beach vibes) consistently impress. You know you’ve made it as an LA beer bar when a 140-year-old brewery in Belgium loves you so much they offer to make you a custom house beer (Brouwerij Van Steenberge’s Lucky Baldwin’s Red). Tucked into a labyrinthine two-story location on an alley in Old Town Pasadena, the original Lucky Baldwins is a British pub founded by two Brits that serves British food, screens British soccer, and has a sweeping tap list of British and European beers. Lucky’s has a long tradition of bringing new beers to LA (in the ‘90s, it was the first Chimay draft account in the region) and across three Pasadena-area locations now equally supports friends both local and international. Sarah Bennett is a contributor to Thrillist.